New, high-precision equipment orbiting Earth aboard the Hubble Space Telescope is now sending such rich data back to astronomers, some feel they are crossing the final frontier toward understanding galaxy evolution, says Todd Tripp, leader of the team at the University of Massachusetts Amherst. Galaxies are the birthplaces of stars, each with a dense, visible central core and a huge envelope, or halo, around it containing extremely low-density gases. Until now, most of the mass in the envelope, as much as 90 percent of all mass in a galaxy, was undetectable by any instrument on Earth. Tripp, postdoctoral researcher Joe Meiring and theoretical astronomer Neil Katz are co-authors of several companion articles reporting advances in understanding galaxy evolution based on the new COS data in the Nov. 18 issue of Science. Other lead investigators are Nicolas Lehner of the University of Notre Dame and Jason Tumlinson of the Space Telescope Science Institute, Baltimore. “With the new spectrograph we can see galaxy halos out to at least 150,000 parsecs,” says Tripp. One kiloparsec is about 19 trillion miles. “Where once we saw only the framework we are now getting a more complete picture, including the composition and movement of gases in the envelope, varying temperatures in different locations and the chemical structure, all in incredible detail,” Tripp adds. 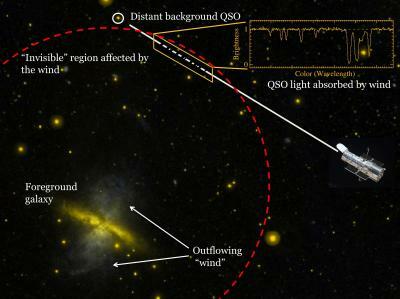 In particular, data on the chemical composition and temperature in the gas clouds allow the astronomers to calculate a galaxy’s halo mass and how the gaseous envelope regulates the galaxy’s evolution. Another overall mission focus is to explore how galaxies gather mass for making stars. The astronomers have found that heavy elements in the envelopes surrounding the most vigorous star-forming galaxies continuously recycle material, as supernovae explode and shoot hot gas for trillions of miles. Faster-moving material escapes the envelope, but slower-moving particles collapse back into the center and restart the cycle. Further, the speed at which gases are moving in different parts of a galaxy is critical. Slower speeds may mean cooling gases, ready to collapse back into the core. Hotter gases are likely expanding and might escape the envelope. Because the light emitted by this hot plasma is so faint that it is effectively invisible, astronomers use a trick to illuminate it from behind, like studying a misty fog bank by looking through lighthouse beams. In this case the lighthouse is usually a quasar, a super bright object behind the galaxy of interest. Gathering several sightings through the fog, scientists can piece together a map of the gaseous envelope. Certain wavelengths of light emitted by the quasar are absorbed by the ions in a galaxy’s envelope. With COS, a whole new area of the electromagnetic spectrum has become visible. To learn more, Tripp and colleagues also calculate concentrations of the many elements such as hydrogen, oxygen, sulfur, carbon and neon in the envelope, plus up to five ions of each. One of the neon ions has turned out to be particularly important.